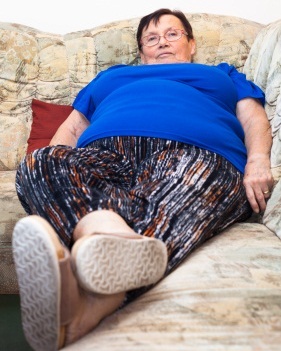 Obesity may be a risk factor for the frail bone disease osteoporosis, a study has suggested. Researchers from Harvard Medical School discovered that people who are overweight have hidden fat inside their bones that could make them weak and prone to fractures. Based on 106 scans of obese but healthy men and women the researchers found some people carry fat in hidden places like the liver, muscles and bone marrow as well as their belly, hips or thighs. Study lead Dr Miriam Bredella says apple-shaped people who carry weight around their waist may be at greatest risk. "If you have a spine that's filled with fat, it's not going to be as strong," she added. "Obesity was once thought to be protective against bone loss. We have found that this is not true." The bone marrow is where osteoblast cells responsible for new bone formation live. Dr Bredella reasons that if more of the marrow is taken over by fat cells then this will weaken the bones.